Vishal Sikka Completes One Year At Infosys. What’s Changed? An ‘outsider’ to the second largest Indian IT service family, Vishal Sikka, the CEO of Infosys, has completed a year in office. This has been a year of relentless effort to set Infosys on the right course, to instigate innovation and modify the existing business model to make the company future-ready. Infosys was in some strife when it approached Vishal Sikka. Senior resources and customers were leaving. The company was facing growth challenges and had lost 17% of its market cap. Naturally, when Sikka, an executive board member of Germany’s SAP, graduate from Syracuse University and PhD in Artificial Intelligence at Stanford, came in charge, people had their doubts. He was not only unrelated to Infosys, but also to Indian IT service industry. He was new to the business and there were piles of challenges to deal with. But one year later, there is enough evidence to cast all doubts aside. Infosys announced 7% quarterly revenue last month, which is the highest sequential growth in 15 quarters. Compared to last year, net profit of the quarter increased 5%. Sikka posted, “Our Q1 results saw the best revenue growth in 15 quarters. Most of this was due to great execution by our sharply focused leadership teams, and some of it due to the innovation seeds that we’ve sown over various points last year, that are starting to bear fruit. But again, the 90-day cycle, an imposition largely constructed by public markets around the world, seems to defy any meaningful purpose. 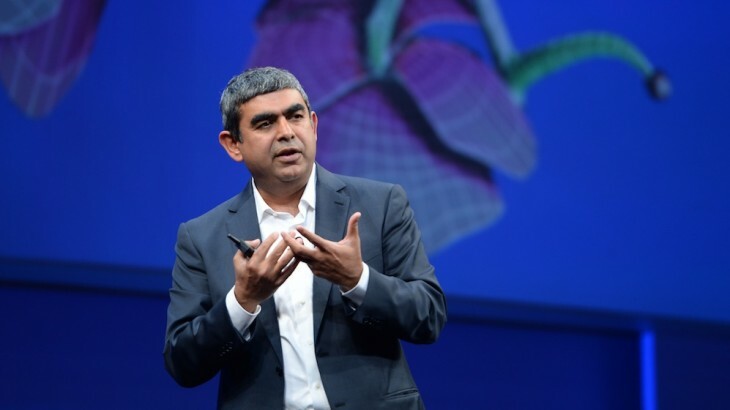 Indeed, arguably, focus on 90-day performance, can often distract us from longer-term progress.” The seeds he was talking about were automation and operational efficiency – two most important focus areas of Sikka since he came in charge of the company. With him in charge, Infosys has also started focusing on high-margin services like artificial intelligence and digital technology. Quartz published how Infosys’ net profit and revenue have fared during the last five quarters, after Sikka joined as the new CEO in the middle of the July – September 2014 quarter. Talent retention was one of the biggest challenges Infosys faced.Nearly 13 top level resources resigned between 2013 and 2014 for better opportunities. “About 2,850 people quit in the month before I joined. This March, 1,350 employees left; the number has halved”, Sikka said in an interview. So what did he do different? Well, he made Infosys a desirable place to work at. So within the first week of his job he announced 5,000 promotions. In next few months he initiated ‘Murmuration’, an engagement program to crowdsource ideas from employees. He also did away with the formal dressing dictum and allowed the staffs to come to work in casuals. Sikka’s ability to empathize and infusing a sense of direction to the employees are two most crucial factors that worked in favour of employee retention. He started an effort to directly acknowledge employees for good work, even if the person doesn’t report to him directly – a practice new to a company of Infosys’s stature. “As an IT services firm, we are not supposed to innovate; we just do what others tell us to. That thinking makes me angry and disturbed, and I’m determined to change that”, he said in an interview and he did just that. “Three of Infosys’s best educators spent three days at the design school in Stanford. Then three from the design school came to our Mysore training campus for two days. Between them, they have trained 31,000 people”, Sikka added. Sikka invested $200 million to acquire cloud services company Panaya, in California and set up a $500 million fund for further investments in startups. “We celebrate startups because entrepreneurs find things we didn’t know we wanted. Problem finding is that skill where we think of innovation as desirable, feasible and viable. Infosys will have tens of thousands of employees who will become problem solvers for our customers. They will be the entrepreneurs who go in search of the problems, and they will be strategic to our business. We can be the private equity company that invests in people who are finding problems and solving them. There are tremendous startups in the Silicon Valley, Boston, Israel, Ireland, Berlin, China. We want to invest in them and participate in their financial success”, he said. One of the fortes of Sikka is the ability to stir confidence among all stakeholders – employees, clients and investors. He stressed on technologies like automation, robotic, artificial intelligence and design thinking. The new model Sikka introduced in the first year of being at the helm of Infosys is – ‘Renew and New’. The focus is to renew and improve the way things are done at the company. “We have folded in Lodestone [a Zurich consultancy acquired in 2012] and deeply integrated that into the company. That team has 100 very distinguished senior people, and each has been allocated two of our top 200 customers. They will co-lead with the sales team, and the combination will bring the company to the client in a more holistic way. A central team led by a brilliant design thinker will weigh in on every proposal we make. That team has helped us bag five major wins in the last few weeks”, he said. The results are shining and the right direction is clearer to Infosys now. But it will take time to see how the new business model works out for the company.